The Sugden Masterclass PDT-4F Precision Digital Transcriptor is a true successor to the Masterclass PDT-4, absolutely dedicated to ‘Rescuing Music From Technology’. The passage of time in the audio electronics industry is witness to the obsolescence of many components, processors and the actual products to which they are associated. Sugden, as product designers and manufacturers have to give consideration to product support, longevity and of course performance. It was the first two parameters that initiated Sugdens development of the new PDT-4F. The PDT-4F is the fusion of various multitudinous DSP devices available for CD product development and Sugden have achieved the pinnacle of natural musical performance with a combination of mixed techniques and technologies. A DVD disc spinner modified to become a dedicated CD engine. This unit includes an output buffer with storage and extremely accurate clocking facilities. An S/PDIF digital interface transceiver with jitter attenuating PLL. A pair of stereo 16 bit audio DACs without over sampling and digital filtering. Current to voltage converter. A 55 kHz post conversion filter stage. A ‘Class A’ discreet component output stage with optional phono/asymmetric or XLR balanced output options. The fore mentioned stages coupled to a power supply with eight regulated voltage supplies and twin transformers combine to achieve Sugdens goal of ‘Simply More Music’. The PDT-4F exhibits a high energy open rich sound with powerful bass and no high register edginess. These characteristics are the fusion of different technologies in the paramount cause of musical performance. The non over sampling filter less DAC arrangement with post analogue filtering is the root source of the unit’s musicality. Whilst our chosen solution may be anathema to those who believe the quality of sound discerned by measurement is the preferential route, we prefer musical performance. The end game for this Sugden Precision Digital Transcriptor is full communication with the musician’s performance. A balanced output stage utilising, a state of the art dual operational amplifier, and discreet component output stage gives the opportunity to enjoy the player’s full dynamic range and focus in a slightly larger soundstage. The PDT-4F is an enhanced CD player as it also has digital input and digital output facilities. These signals are supported by a digital interface transceiver in the following manner. The digital input port on the transceiver is connected to the CD head or the digital input socket through a high quality change over relay. With the PDT-4F in stand by mode, the digital input is connected to the transceiver and the power supply for the DAC is enabled. This allows digital signals from other ancillary equipment to be processed through the PDT-4F’s DAC. The interface chip has auto frequency detection/synchronisation at its input and can work with sample rates from 32 to 192ks/s. The digital output is a cleaned up, re clocked (de jittered) version of the digital in signal. With the PDT-4F switched on, the CD engine and controls are activated and output from the CD engine buffer is connected to the transceiver for ongoing processing through the audio DAC circuitry. The S/PDIF signal is again re clocked by the transceiver and is available on the digital out socket. This makes a signal source available for CD recordings. There are two stereo analogue output facilities available on the PDT-4F, an asymmetrical analogue output stage (high quality gold plated phono sockets) and balanced analogue output stages accessed through twin XLR sockets. 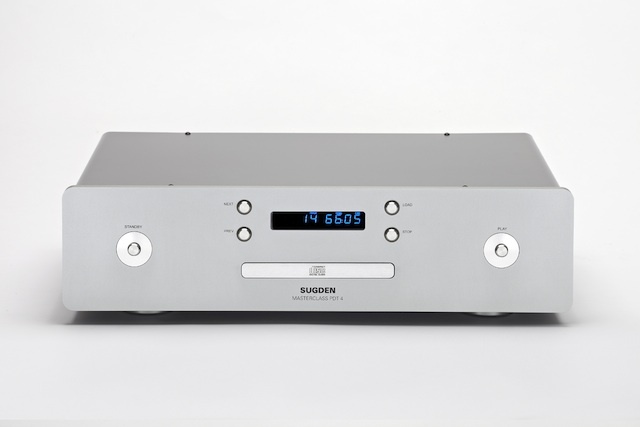 The Sugden Masterclass PDT-4 F, as with all Sugden Audio products, is designed and manufactured in England with little recourse to outsourcing. We have a dedicated team of engineers, technicians and assembly staff of long service who are immersed in our company culture. They take a pride in their work and know that our competitors are after their jobs. The Masterclass PDT-4F is housed in a non magnetic metal casing which is the ideal for dealing with spurious high frequency contamination and maintaining the best environment for signal processing. A 10mm thick aluminium front panel anodised for scratch resistance and to enhance appearance also provides added weight for immunity from standing waves. The case is also supported on shock absorbing feet. The signal boards from S/PDIF signal generation to analogue output are all of high quality with gold plated tracks and are populated with components of the highest quality for audio processing. Components are subjected to low stress for long life and continuous high and stable performance. The power supply board also has gold plated tracks and through hole components with ratings to ensure longevity in service. The inclusion of psycho acoustic techniques to enhance the musical performance of Sugden products include; component selection, silver wires, gold plated connectors and the overall topography of the audio signal to logic functions, power supplies and case work. 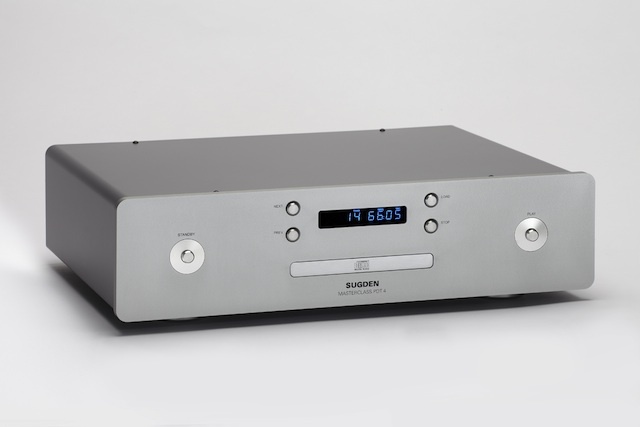 Sugden presents the PDT-4F as a dedicated CD player with the advantage of operating as a high quality DAC and source of digital signal for recording purposes. Outputs – One RCA stereo analogue, One XLR Balanced stereo analogue & One digital coaxial. Input -One S/PDIF coaxial. Connect Apple TV, Sonos CONNECT, etc. Front panel controls -Standby, load, play, next, previous & stop. Remote control -Direct track access, repeat, store, random, play, pause, stop, load, prev, next, search a-b & time. Display – Track, repeat, store, random, play, pause search track time, A-B & CD length. CD Compartment – Accepts both 12cm and 8cm CD and CDR ‘Red Book’ audio discs and MP3. Frequency response – 20Hz – 20kHz +/-1.50dB points. Signal to noise – >80dB. Gross weight (packed) – 9kgs. Dimensions – 92mm x 430mm x 310mm (HWD). 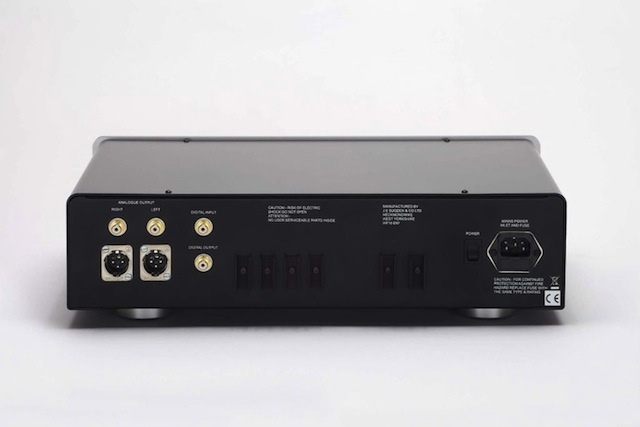 Digital input – S/PDIF 16-24 bit word length, with sample rates from 32 to 192ks/s. Power consumption – 53 Watts. Additional facility – Placed in standby the PDT-4F becomes a stand alone Digital to Analogue Converter. Recommended Retail Price – AUD$6,450.00.